From Spain to the United States, Presencia Thread is here! Presencia offers vibrant colors and special threads for the serious hobbyist or thread artist. The most complete and colorful line of 100% mercerized Egyptian cotton available. All cotton products from Presencia are solid dyed and colorfast. Presencia Finca Perle Cotton is 100% extra-long staple Egyptian cotton, mercerized for strength, colorfast, bleachfast* and shrinkfast. Presencia Finca Mouline Embroidery Floss is 100% extra-long staple Egyptian Cotton, mercerized for strength, colorfast, bleachfast* and shrinkfast. Designed to compliment the Jo Morton fabric line. 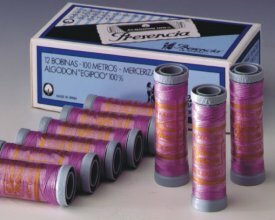 100m 50wt 3-Ply Mercerized Egyptian Cotton Sewing Thread.